Similar to what I described in another meta post I've just seen a first time user become a "suspect" and discussed in the third person like they'd broken some rule, rather than have someone helpfully explain to them what the concern is. I'd like to know what might be the best and most welcoming way to deal with questions that might be related to homework, or just as easily might not be. Should we apply "guilty until proven innocent" and vote to close right away, then let the first-time new user come back to find out that some users believe their motive was in question, then have to slog through a re-open voting process just to say "no, it wasn't"? There is NO prohibition against homework questions here at Astronomy. StephenG's comment that he was voting to close for suspicion of homework was ill-advised and had no basis in site policy. JanDoggen then made reference to "some guidelines across the network" but this is a red herring. Most experienced users will be aware that each SE site is at liberty to define its own rules for what's on-topic. For example, homework questions are explicitly permitted on Physics.SE, and that meta post provides guidelines for how they should be asked (and links directly from their on-topic page. An answer that doesn't help the student learn is not in their own best interest. In fact, that EL&U meta post is mostly based on a similar post on SO Meta. So Jan, it looks like there are popular, high-traffic SE sites that cautiously accept homework questions. I think this specific issue touches on a broader problem here on Astronomy. I've previously posted here because of some users' excessive eagerness to close questions as "off-topic" when they're nothing of the sort - they're merely poorly researched, overly basic or just plain low-quality. But as uhoh rightly points out, some are low-quality simply through a combination of inexperience on our site and the lack of a post-grad; a bit of tolerance (and assistance) might be a good thing. I'm probably a bit quick on downvotes here, and perhaps I too need to be a bit more tolerant. But a downvote, while disheartening to the receiver, is I think far less affronting than having their question closed, especially when the question is on-topic but is being closed as purportedly "off-topic". I think it's worthwhile reminding ourselves (and especially reminding those of us who tend to forget) that SE's philosophy is to encourage answers rather than eliminating the questions. [closing] should be your last resort. Close questions with an eye toward improvement and re-opening, not driving users away. Not the answer you're looking for? 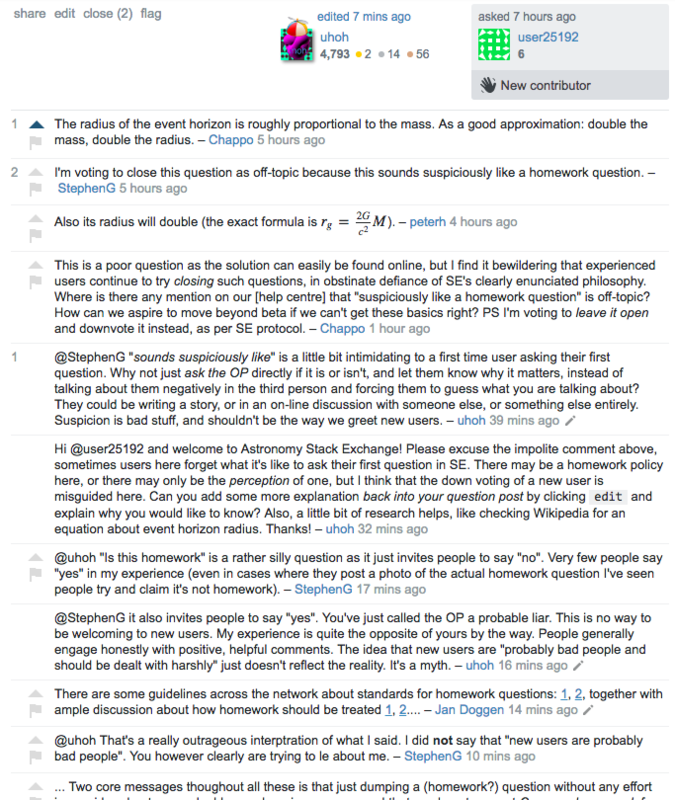 Browse other questions tagged discussion specific-question new-users . Is there a key argument for not merging Astronomy and Space Exploration Q&A sites? Is the topic scope too confusing for new users? Make no prior research or effort a reason to close? How is this question “primarily opinion-based”, and can I save it from closure? Would this question have been better to ask in Astronomy? Could it be split it into two? Something else?